At least 37 people were killed during clashes between armed inmates and security forces at a small prison in southern Venezuela. Gov. Liborio Guarulla said the bloodshed came after fighting erupted between inmates and their jailers in the prison in Puerto Ayacucho, capital of sparsely populated Amazonas state. He said security forces raided the facility seeking to restore order in the prison, where the inmates had seized control several weeks ago. A tapir is a large, herbivorous mammal, similar in shape to a pig, with a short, prehensile nose trunk. Tapirs inhabit jungle and forest regions of South America, Central America, and Southeastern Asia. Venezuela officially the Bolivarian Republic of Venezuela is a federal republic located on the northern coast of South America. It is bordered by Colombia, Brazil, Guyana and the islands of Trinidad and Tobago. The country has extremely high biodiversity with habitats ranging from the Andes Mountains in the west to the Amazon Basin rain-forest in the South. The territory now known as Venezuela was colonized by Spain in 1522 amid resistance from indigenous peoples. In 1811, it became one of the first Spanish-American colonies to declare independence. It is not in great shape and is in news for wrong reasons ! – the mounting crisis in Venezuela is entering a new chapter as President Nicolás Maduro's plans to rewrite the constitution face a pivotal vote. Shortly, 545 seats in the new Constituent Assembly will be decided. The winners would essentially replace the current National Assembly, which is controlled by Maduro opponents -- who have called for a boycott of the vote. For months, opponents have taken to the streets to voice their frustration with Maduro's government. More than 100 people have died in connection with bloody protests. Chaos has consumed this country of astonishing natural beauty -- one that also possesses the largest proven oil reserves in the world. How did a potential paradise become so lost ? While Venezuela has become a humanitarian and economic mess, it is worth looking at the one industry the Chavez and Maduro regimes relied on to bring wealth to their socialist country. With utter neglect of existing private industries like agriculture, and with reallocation of resources and wealth through centralized planning, the Venezuelan government has managed to bring hunger to its people. Venezuela became dependent on oil when it did not need to. Oil revenue fuelled Venezuela's economy under former President Hugo Chavez. When oil was $100 a barrel, billions flowed through the state-owned petroleum company and were siphoned off for social programs and food subsidies. But when oil prices fell dramatically, those massive subsidies became unsustainable. Simple Lessons for us too !! ~ don’t live on subsidies alone !! Venezuela is split into Chavistas, the name given to the followers of the socialist policies of the late President Hugo Chavez, and those who cannot wait to see an end to the 18 years in power of his United Socialist Party (PSUV). Chavistas praise the men for using Venezuela's oil riches to markedly reduce inequality and for lifting many Venezuelans out of poverty. But the opposition says that since the PSUV came to power in 1999, the socialist party has eroded Venezuela's democratic institutions and mismanaged its economy. Chavistas in turn accuse the opposition of being elitist and of exploiting poor Venezuelans to increase their own riches. They also allege that opposition leaders are in the pay of the United States, a country with which Venezuela has had fraught relations in recent years. ~ and can a Nation plunge to this level ?? - starving thieves steal animals from Venezuelan zoo to EAT as the country struggles with chronic food shortages reports MailOnline which adds that animals of ten different species stolen from zoological park in Venezuela that includes thefts of tapirs, buffalos and wild boar-like peccaries – the sad part is that authorities believe they are being taken from the park to be eaten !! 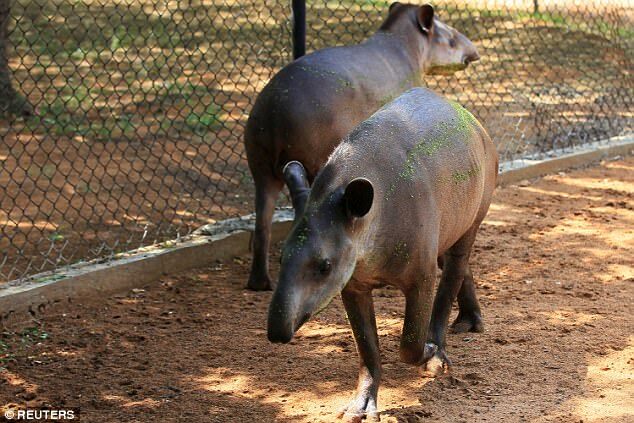 A wave of animal thefts in city of Maracaibo near the Colombian border - including tapirs and a buffalo - have been linked to the chronic food shortages in Venezuela. Most recently, two collared peccaries, similar in appearance to boars, were stolen over the weekend, local police say. The head of the Zulia Metropolitan Zoological Park in Maricabo said thefts in recent weeks had affected ten species. 'What we presume is that they (were taken) with the intention of eating them,' Luis Morales, an official for the Zulia division of the National Police, told reporters on Tuesday. The chaotic collapse of the country's socialist economic model has created chronic food shortages that have fuelled malnutrition and left millions seeking food anywhere they can find it, including in trash cans and dumpsters. President Nicolas Maduro blames food shortages on opposition protests that have blocked streets and highways and a broader 'economic war' led by adversaries with the help of Washington. Leonardo Nunez, head of the Zulia Metropolitan Zoological Park, blamed 'drug dealers' for the thefts, saying they are selling them on the black market. Shortages have also left zoos without sufficient food to feed animals, with some 50 animals starving to death last year at a Caracas zoos, according to a union leader. Sad state of affairs indeed ~ political parties would fight, their activists die for them – in the end the common man’s life becomes miserable – poor governance, no ethics – shambolic.